Everyone talks about curb appeal because the front of a house is the first impression that guests, passersby, and potential home buyers get when they see your house. Having a beautiful front exterior to your home can make you feel better about your house, but how do you choose which projects to take on? To help you make the decisions, here are some of the most important projects that you should consider. Furniture on a front porch, stoop, or out by a flower bed adds a charm that’s quite functional. Wicker is a popular type of furniture that looks great with many styles of homes. Otherwise, two other often-used materials are wrought iron and wood. Yard Bird explains that you can create a conversation area on the front porch with a couple of chairs and a table. Otherwise, a bench on the front stoop is the perfect addition if you prefer your family to take their shoes off before they enter the home. 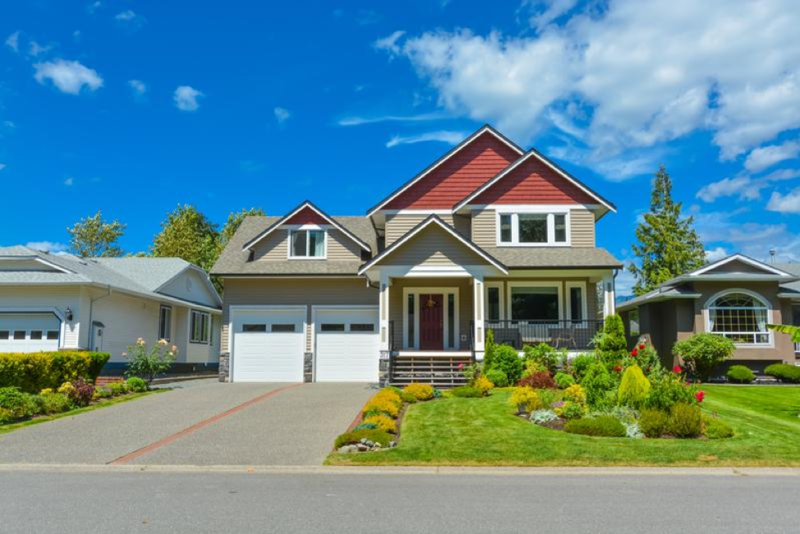 Don’t underestimate how much the landscaping on your front lawn impacts the overall aesthetic of your house. A well-manicured lawn adds drama to an otherwise plain house, but overgrown shrubs and trees make houses look messy. You can make your front yard more attractive simply by trimming back greenery. Then, assess if any of the landscaping has overgrown its current space. Also, consider adding plants and flowers that have color. Habitation Realty explains that planting fresh greenery makes your home seem cleaner and more presentable from the outside – as an added bonus, this improves your home’s curb appeal if you ever decide to sell. For instance, evolvulus is a shrub that has blue flowers, and the best part is that it blooms continuously. Pentas are another flowering shrub that has pink blossoms that bloom continuously. If you’re selling your home, make sure that you trim back bushes just before showings. Burgundy is one of the most classic colors used on front doors, but if you want to keep it bright, try turquoise or teal. Other popular colors for front doors include gold, blue, black, and orange. When you’re choosing a color for the front door, you’ll need to look at the undertones of the color of the majority of your house. Neutrals often have undertones, and if you don’t understand them, you can choose a color that clashes. For instance, if you have a beige house that has purple undertones, don’t choose red as the color for your door because, more than likely, you won’t like the color combination. Professional painters can help make sure the colors work well together and that your home’s exterior looks presentable. Creating a comforting yet vibrant exterior for the front of your home plays an essential role in the way that you and other people feel about your house when first seeing it. Pick one project per weekend, and then you’ll slowly see it all come together.